Learn more about this remarkable butterfly and how you can help monarchs and other pollinators. Fall is here, and with the cooler temperatures and lessening daylight, many different species have begun to migrate. Mammals, birds and even insects make a journey away from their summer range to find a place suitable to spend the winter. One remarkable insect that makes such a journey is the monarch butterfly. Monarchs from Michigan typically travel south to Mexico to overwinter. 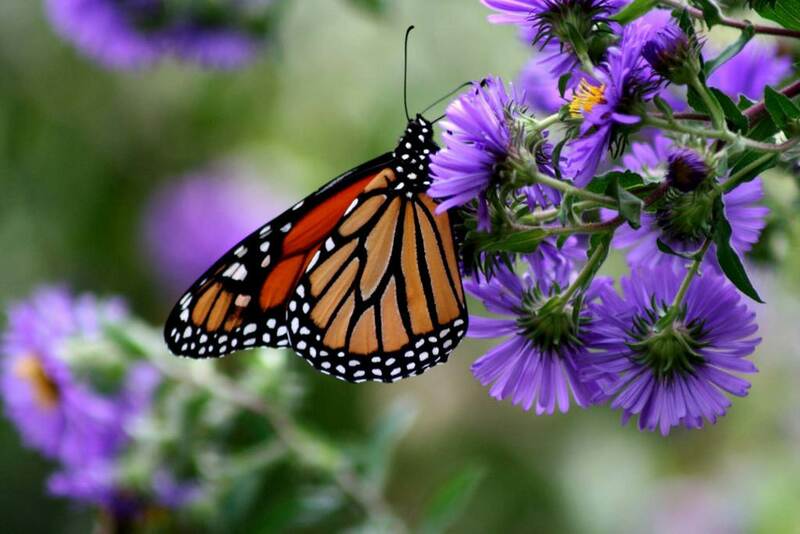 Four new generations of monarchs are born each year, so the generation that migrates north in the spring is not made up of the same individuals that migrate south! Because of this tremendous journey, monarchs have need for a variety of habitats. In the early summer these butterflies lay their eggs on milkweed because that is the only plant their caterpillars will eat. Monarchs also need habitat to overwinter in, not to mention habitat where they can stop and refuel along the way. They are very active insects and require a wide variety of flowering plants to provide the food they need to survive and make their long journey. Unfortunately, this remarkable insect has had a 90-percent decrease in its eastern population over the last 20 years. There are many factors that have contributed to the decline, but one of the major reasons is habitat loss. Habitat loss in their summer range – like Michigan – and in Mexico, where they overwinter, has had an impact. 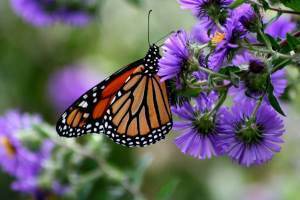 Climate change and pesticide use also affect monarchs and other pollinating species. Monarchs are not the only pollinating insect in need of our help. Bee populations also have been declining world-wide. In fact, the U.S. Fish and Wildlife Service recently proposed listing the rusty patched bumble bee as an endangered species. Many organizations and individuals have become concerned about pollinator populations. Pollinators, like butterflies and bees, are responsible for approximately one-third of the world’s food source. Imagine that one out of every three bites of food you eat is there because of pollinating insects’ services. Because of the important role pollinators play in people’s lives, it is up to us to help keep these pollinator populations abundant and healthy. There are many ways that you can help pollinators, even in your own backyard! Creating habitat for pollinators is a great place to start. Milkweed is important for monarchs, because this is where they lay their eggs and where their caterpillars get nutrition as they grow. Other flowering plants are important to have around too, as they provide nectar sources for adult monarchs and many other types of pollinators. Even growing a variety of flowering plants in pots on your porch can provide a food source to pollinators in the area. You also can help by keeping an eye out for monarchs and bees and reporting any sightings. Fall and spring are good times to watch for migrating monarchs. Anyone can report monarch sightings at Journey North or Monarch Joint Venture and bee sightings at BeeSpotter or Bumble Bee Watch. Donations also can help pollinators in Michigan. You can make a tax-deductible contribution to the Nongame Wildlife Fund, which provides funding for the Department of Natural Resources to conserve Michigan’s endangered, threatened and nongame animals, plants and their habitats. The Nongame Wildlife Fund supports habitat restoration projects that benefit pollinators, like the monarch. Join us in celebrating monarchs, bees and other pollinators by participating in tremendous ongoing conservation efforts. Learn about Michigan's Pollinator Protection Plan and find additional pollinator information and resources at Michigan State University Extension’s Pollinators & Pollination page. Find out more about what you can do to help pollinators in Michigan, monarch biology, current projects helping pollinators, and activities and resources for kids and teachers by visiting mi.gov/wildlife and clicking on the Monarchs in Michigan box. Help save the monarch!